Why use a B&W CCD ? Better chip sensitivity : allows for a shorter exposure time to cope with the seeing conditions, and also performs better under a low transparency sky. B&W cameras don't close the door to planetary color imaging. When used with a set of color R GB filters, or merely in conjunction with a color web cam, they provide color compositions of better quality. New cameras dedicated to planetary imaging have been recently commercialized. Have you ever heard of Lumenera, or DMK at some forum ? This is a revolution in the world of amateurs willing to obtain the best equipment possible for planetary imaging. It's not just web cams anymore, there are true cameras able to captures images at an impressive frame rate of dozens of images per second (common frame rates are 20 to 50 per second, although bright planets can allow rates up to 80-100 per second ! ), while old web cams were confined to only 10 images per second . These frame rates are very useful to "beat the seeing" and allow one to obtain enough raw frames in a very short period of time, which is a major advantage when observing Jupiter or Mars with color filters. Indeed, Jupiter has a very quick rotation, and the capture time must be short. Color filters must be rotated in 2 to 3 mn with high frame rates to get enough frames for an adequate signal-to-noise ratio. Modern cameras make this challenging goal accessible. 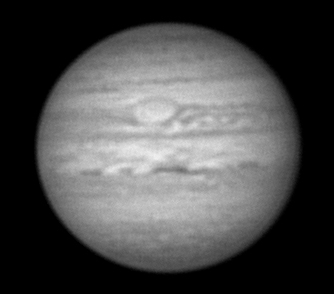 These two sets of images show that under good conditions and with a bright object, a B&W webcam can produce results as good as an optimized planetary CCD camera (like a Lumenera) - although with more difficulty because of the low frame rate. The following set also makes a comparison between a B&W webcam (ATK-1IHS) and a Lumenera LU075M. The LU075M images are smaller, but more contrasted. Conditions were superb with the ATK, but "only" very good with the LU. The webcam does as good but this is exceptionnal. When the seeing is less than good, the higher framerate of the Lumenera produces raw frames of much higher quality. 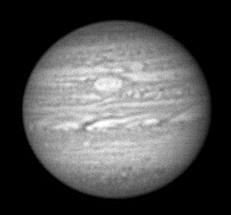 The following set show two Jupiter images taken with the two different cameras, but with the same telescope, same barlow lens, same filter. Under fair conditions, the webcam is outperformed by the Lumenera with a much less sharp image. And this while the planet was noticeably higher in the sky in 2005. Here's a description of the two best cameras: the SKYnyx2-0M and the DMK 21AU04.AS. I will shortly review another model with a larger sensor, useful for the Moon or the Sun. The Lumenera camera SKYnyx2-0M is equipped with a Sony monochrome 1/3" chip, which has a resolution of 640x480 pixels (1 pixel = 7,4 µm). The chip is very sensitive with little noise (read noise = 10 e- rms), permitting images of high resolution. At high resolution the 320 g camera presents a maximal frame rate of 60 frames per second (fps) without compression (no need to modify the camera with the Raw mode). This value can be increased even further by cropping, but in practice very few targets will bear such a high frame rate ; moreover, this demands a very powerful computer. None the less it is already much more than the maximal 10 fps of the web cams, allowing for better results against the seeing (the higher the frame rate, the better the chance to capture images during good seeing moments). One should always consider cropping the image, as it produces smaller files on the disk. Another advantage in comparison with web cams is the 12 bit resolution of the camera (8 for web cams), which means images with 4096 gray levels instead of 256. The Lumenera SKYnyx2-0M has a fast USB2 output to maximize speed transfer of data and to make installation easy on recent computers. Time exposure goes from 1/1000 of sec. to 3 min (useful to begin deep-sky observing). More models are available. Note however that the 640x480 chip (2-0M) is more suited to planetary imaging while those with greater chip size (like 1392x1040) will be used with greater success on the Sun or Moon. Those other models make frame rates greater than 15 fps more difficult to achieve, which is much less important here. The numerous advantages of the SKYnyx2-0M are regrettably counterbalanced by a costly price of around $900, making it not accessible to everyone. One must be absolutely involved in planetary imaging to afford the product. The DMK monochrome CCD "DMK 21AU04.AS" is an alternative to the Lumenera. It's provided by the Imaging Source society, also working with a USB2 port. Using a 1/4" chip, it produces images of greater size than its concurrent the SKYnyx2-0M. The resolution is still 640x480 and the uncompressed frame rate is 60 fps at maximum. The shortest time exposure is 1/10000 of a second. But what is the difference between the DMK and the SKynyx ? Mostly its price ! $390 is a much more affordable price. Unfortunately, this lower price is due to its lower performing technical characteristics. As an example, the DMK has an 8 bit output (256 gray levels) like simple web cams, where the Lumenera produces raw frames with 4096 gray levels. Another interesting model from DMK is the 31AU03.AS with a 1/3" chip, offering a larger field of view but also a smaller image on screen, and a lower maximal frame rate of 30 fps (versus 60 for the SKYnyx2-0M). This intermediary model in the DMK series is polyvalent however, producing nice planetary images and great lunar and solar images thanks to the larger field of view. Its price is $630. Theoretically, the Imaging Source cameras can expose for up to 60 min (perfect for deep sky) unlike 3 min for the Lumenera's. In practice however 30 seconds or one minute is a maximum due to the absence of any cooling system. Christophe Pellier Thank him very much for his careful reading of the tutorial and his many useful tips and images.